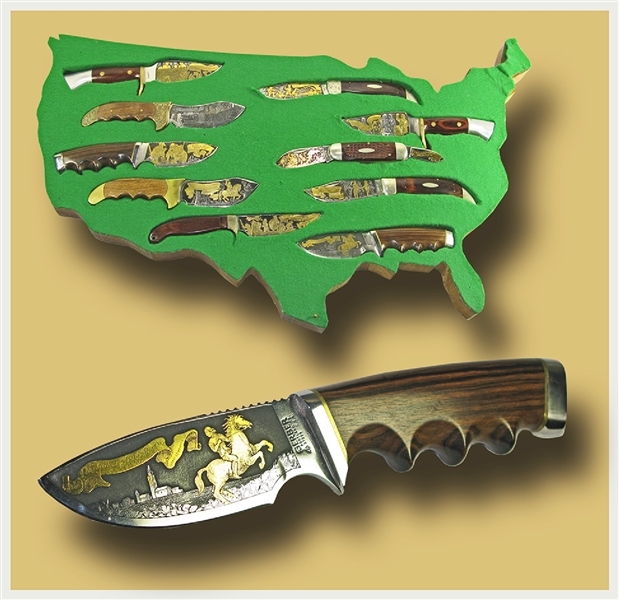 Comprises ten knives, each engraved with a patriotic scene on the blade. Every scene was hand drawn on each knife by the artists, Sherrill Shaw and Leonard Leibowitz, and etched under their supervision: (1) The Boston Tea Party 1773 (Rigid), (2) The Ride Of Paul Revere 1775 (Gerber, Model 400), (3) 1775 The Shot Heard Around The World (Case P172), (4) The Declaration Of Independence July 4, 1776 (Westmark 703), (5) Washington Crossing The Delaware 1776 (Olsen 503), (6) I have not yet begun to fight John Paul Jones 1779 engraved on small blade; large blade depicts scene (Case Sunfish Knife 6250); (7) Valley Forge 1777-1778 (Gerber Model 400); (8) Give Me Liberty or Give Me Death Patrick Henry 1736-1799 (Westmark 702); (9) The Victory at Yorktown October 19, 1781 (Case P172); (10) Washington's Triumphant Return To New York 1783 (Rigid). Each knife was numbered 36/200. The set here offered, numbered 5/200, includes the unique USA display case.